A few weeks ago I did another photo shoot, this time for my Spring/Summer 2012 line. Once again my amazing photographer Lise Varrette worked her magic, this time in her new studio space over a five-hour period with a total of nine children! The children were amazing and the photos are beautiful. As I reflect on these twice-yearly photo shoots I can’t help but feel that in addition to tracking my development as a designer, they’re also tracking the growth of my three daughters, my nieces and nephews, and our beloved friends who have generously acted as my models, some for years. 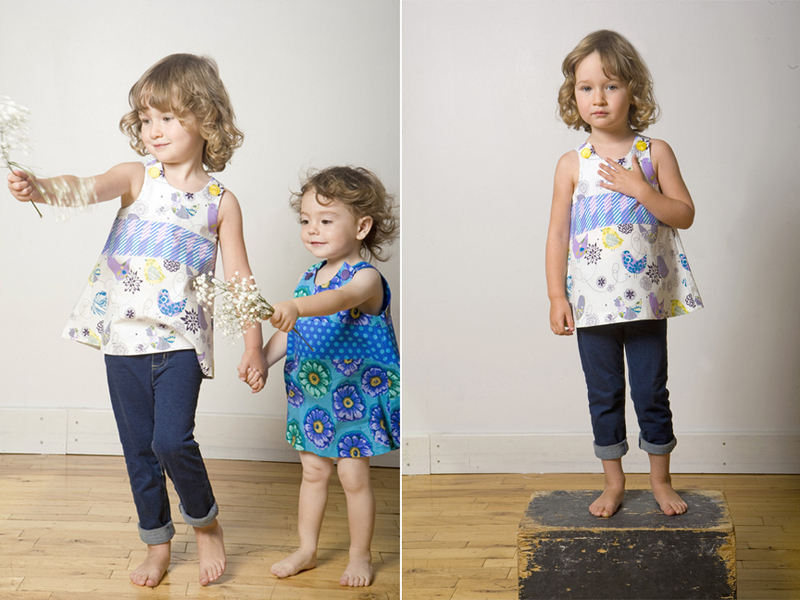 The thing that I love most about these shots is that Anika was once the baby in these photos. 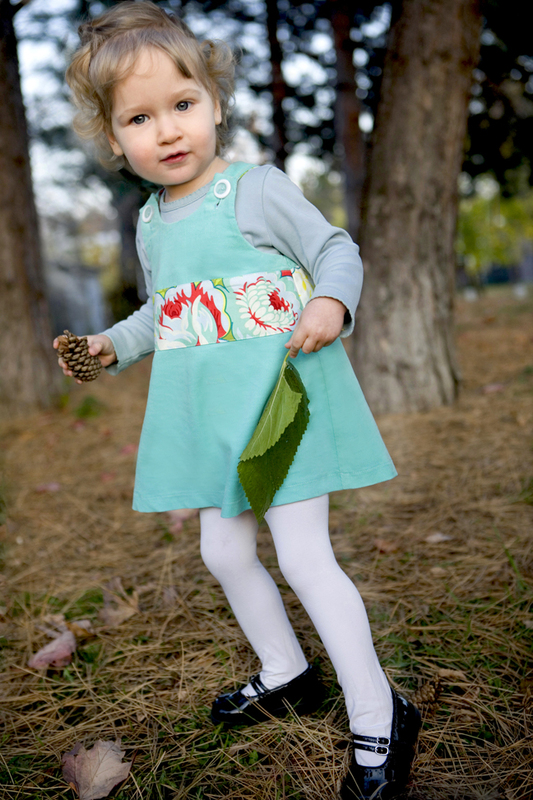 Here she is at the age of 11 months, not quite walking on her own, modeling the Caterpillar Dress with my daughter Georgia, then 3 and a half. 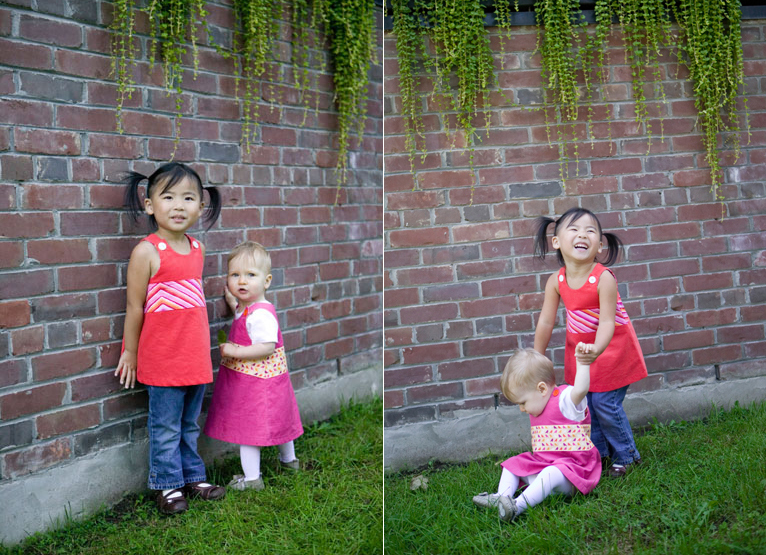 Little Anika held on to the brick wall and shuffled along, turning every so often to check out the camera, while Georgia, amused, shuffled along with her to stay in the frame. Sometime Georgia would take Anika’s hands to steady her and there were quite a few amusing moments. Fourteen months later, just after turning two, Anika modeled the same dress, and to say that she was delicious would be a huge understatement. Anika is quite tall for her age, so it was already getting a little too short to wear as a dress. Next month will be Anika’s fourth birthday and the start of kindergarten, and the dress still looks great on her as a top. 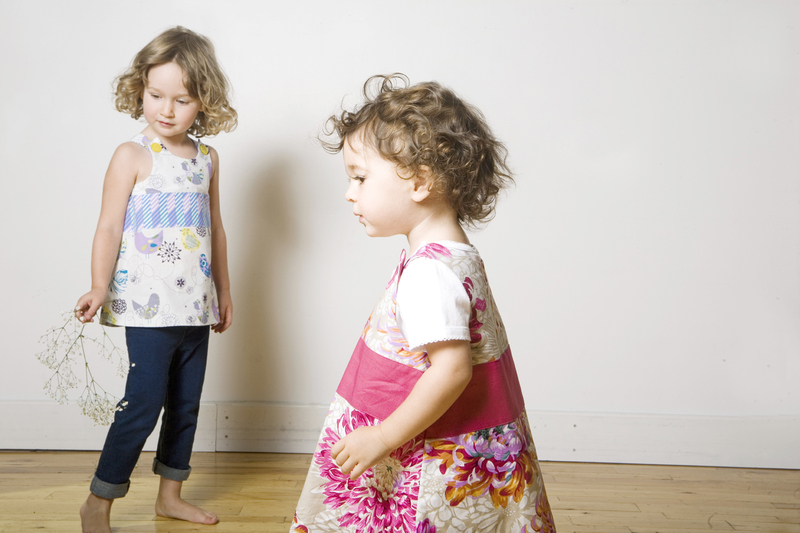 As with all children we love, watching her grow has been a delight, and documenting our growth together through these fabrics and dresses and images feels much more like a wonderful journey together than just a photo shoot.